As a membership benefit, you can receive unlimited CPE & CLE credit through our live seminars/webinars. Stop paying per credit, save money, and receive all the other benefits of your ALA membership. * A nominal fee will apply for live seminar events to cover food & beverages. 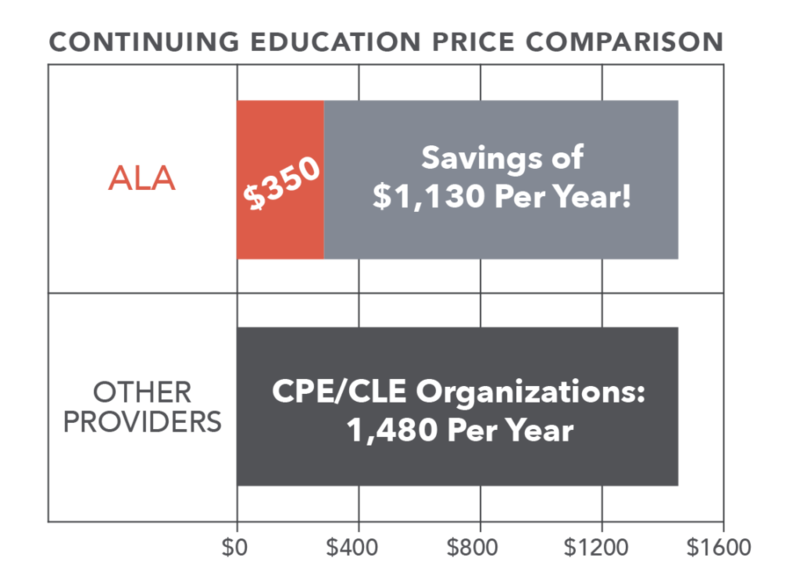 Your Challenge: CPE/CLE offered by associations is expensive and not part of membership dues. Our Solution: We’ve developed an innovative business model that allows us to provide unlimited webinar content (with CPE and CLE certificates) as part of your annual membership. Your Result: You save hundreds, if not thousands of dollars on CPE/CLE each year. You have choices for your CPE & CLE credits. When you join the ALA you have access to high-quality content for a great price. We have examined our competitors and we cannot find another association that is providing CPE & CLE as a free membership benefit. Most associations simply offer a nominal discount on your CPE & CLE credits. • According to a recent study of CPE pricing by NASBA-approved providers, the average CPE price per credit for a live webcast was $52, with a median of $37. • $40 hours of webinars at the median price of $37 = $1,480. • Average and median prices for live webcasts were based on a sample of 77 live webcasts.